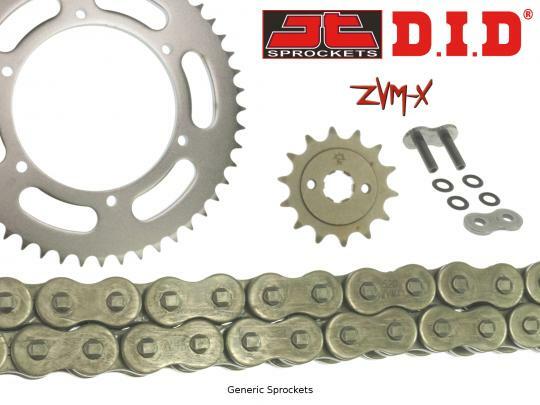 The picture below shows a DID ZVM-X Super Heavy Duty X-Ring Chain and JT Sprocket Kit. Thousands of other top quality spares listed on our website at refreshingly low prices. DID's ZVM-X Chain uses patented X2-ring seals. Like O rings, X rings function to seal in lubrication and keep dirt out, and for the ZVM range the X rings have been redesigned to offer even greater wear resistance and even less friction than DID's original X rings. Where the cross-section of an O ring is circular, the cross-section of an X ring is X or cross-shaped. This gives the seal additional contact points compared to the O ring, offering superior sealing and protection against dirt and grit getting stuck under the seal. In addition, when under pressure an O ring becomes squashed and causes friction. An X ring, when under pressure, diverts this pressure by twisting instead, so an X ring decreases friction between side plates and reduces power loss by 50% of any other type O-ring chain. DID's X rings have 40% greater wear resistance than their regular X ring chains (the VX range) and 34 times that of a DID standard chain. This means more resistance to stretching, bowing and warping and smoother handling. With proper maintenance, an X2-ring chain will last longer than any O-ring or unsealed chain. DID ZVM-X drive chains are always supplied 'open' with a rivet link (included). You will need a specialised tool in order to rivet the chain, or take it to a mechanic who can do it for you. A spring link is available, but a spring link has only 65% of the strength of a rivet link and therefore, a rivet link is always recommended.